We offer a wide range of Stainless Steel Blind Rivets which is corrosion resistant and are incorporated with a large blind head are excellent for thin sheet materials. The Stainless Steel Blind Rivets are meticulously fabricated with high emphasis on quality to make them free from all drawbacks. 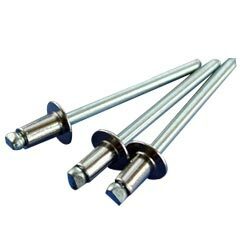 The Stainless Steel Blind Rivets can be availed by our clients at leading market rates.